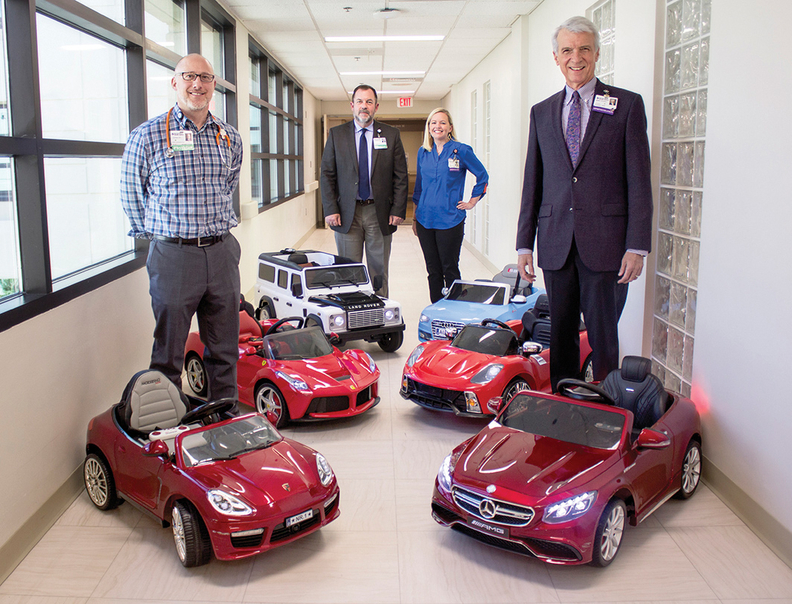 System and hospital staffers pose with the fleet of minicars available at Studer Family Children's Hospital at Sacred Heart in Pensacola, Fla.
You might hear a honk if you visit Studer Family Children's Hospital at Sacred Heart in Pensacola, Fla. Donors, including the hospital's doctors and executives, supplied miniature cars for their patients to drive around the inpatient units and to operating rooms. The red Porsche, white Land Rover, blue Audi and three other minicars are battery-powered and remotely controlled by a staff or family member. Driver's license? There's no need for a trip to the DMV. Patients receive their own “driver's license” with their name and photo at the hospital.